He observed that Dr. YSR’s tragic death once again underlines that we are shaped more by events than our shaping the events. He also paid tributes to Principal Secretary P. Subrahmanyam, Chief Security Officer A. S. C. Wesley, and Group Captain S. K. Bhatia and Captain M. S. Reddy who laid down their lives in the line of duty and conveyed his condolences to their families. Dr. JP appealed to all sections of people to stand united and maintain calm, and the ruling party to ensure orderly and democratic succession. I feel JP has gone overboard here with his comments despite the sobriety of the situation. Even Sonia and Manmohan's tributes were striclty customary. So JP seems to be a bigger fan of YSR?? 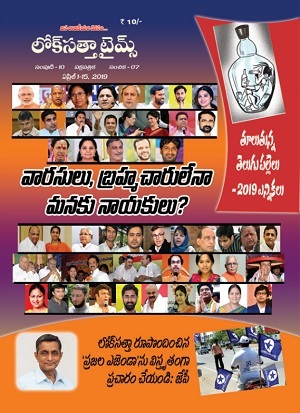 Do not forget that we are talking about the biggest corrupt tenure in the history of not just Andhra Pradesh but any state in free India.How tall are you JP? ?Get it or getout. Though we have seen the biggest corrupt tenure in the history of AP as reigned by YSR . JP amoungst others social activist's animosity against YSR is basically a political confrontation . Life loss necessitates such condolence , JP a leader with a human heart , his expression and words of condolences on such a loss is as expected. 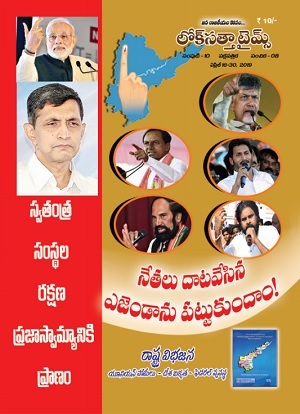 Brother don't talk TDP politics and better start respecting and agree with the facts. YSR was a mass leader with enormous popularity with charsima along with strong leadership. Yes he was a Mass leader and you are one of them.Fullstop.There are only two types he favoured: 1)Maassu 2)Moratu who are you or probably both like YSR?? I am really sad to see some people commenting negatively against YSR. What is the negative propoganda about? Dr. JP hasnt mentioned about corruption in YSR regime in this tribute. So why the hell some people are commenting about corruption here? This is not the right page for such comments. And guys, you dont get anything by cursing or vandalising the image of a dead man. I sincerely pray his soul rest in peace. This is mad rush to score points to be in the books of local cronies/MLAs to get a piece of freebies(populist schemes). Most of the pupulist schemes are not given by any standard procedure but by recommendations by these satraps. He did not want people to demand for what is their right but only by submission to the local satraps. This is one example of what I mean by lowering the standards of all walks of life. This strategy is to turn the satraps and eventually the common man into faceless begging machines. Another example this time with satraps is how the ministers who refused to take oath were the first ones to get there to retake the oath. If this way society as a whole goes down in values like that is seen in African countries we will end up like Africa. I hope you get me. Now please when you want to add to the genuine discussion plase counter my view with your logic/detail but please dont bring up TDP, caste and all that bigotry stuff. Finally if all dead are Angels so will......may that will make you happy?? Why are all dead people good? It's tragic that our society is still feudalistic to a large extent, because of which YSR has a certain fan following among his subjects (yes, his SUBJECTS). JP is speaking to that constituency out of a respect for the dead. There are people who still see their elected leaders as their benefactors rather than representatives - they need to be educated and changed. Well, frankly Mr. Neeladri, you compelled me to comment on this page . Let me tell you an open fact that there is a section of media that is already begun negative propoganda about YSR and the government and your comments only reflects that fact. And its very sad to see terms like "African dictator" used to refer YSR . On the contrary, i havent seen any thing about CBN who is fit to describe by that word. Let me tell you, it is not YSR who suppressed his opponents within the party. It is the people's mandate which suppressed them. Some of them hopefully lost in their very own constituencies . And it is not he who created the unhealthy culture of corruption or favouritism. Tell me how many of his predeccessors ran a corruption free government? Infact it was worse in the CBN period where many farmers around the city suburbs lost their lands to the corporates. CBN has proved to be a Reverse Robinhood. Tell me how many governments in the world are corruption free? Favouritism and corruption are global issues in any democratic society. It is the delivery mechanism of a democratic system itself that entertain these because of the fact that democratic system gives too much of a freedom to the administrators. Mr. Neeladri, i am NOT saying that there was no corruption at all in YSR government. But it was drastically very less compared to his predecessors. And i agree that the death figures are manufactured . But at the same time disagree with you that they are manipulated by his subjects or the government. The goverment so far hasnt issued any figures as such. It is the media that is manipulating them. And speaking about YSR as a person, let me tell you that he was a kind hearted , determined and a good human being. As a leader he worked for the poor and backward classes. It is an undeniable fact. That is what makes him a leader with immense popular support. Let us not discuss anything on this subject atleast on this page. As a leader he worked for the poor and backward classes. It is an undeniable fact. I differ here. YSR has never done anything to make them self-sustainable. He never worked for the welfare of them. I agree that, he spent money for free sops to give to poor and backward classes. But, he never worked for them. Congress and communists parties are the last parties in the whole India, that are really working for poor and backward classes, and not making them as beggars. I am a big fan of JP garu. I have great respect on him and on his ideology. but Person like JP Garu is talking about YSR is not Correct.I completely Disagree With JP Garu. Every one know about YSR Corruption. Leave it but did he ever cared any time that how his schemes were implementing. who are getting benefited. how many persons are really eligible to get the profit on various schemes. While i am doing my Graduation Many of my friends were getting Scholar ships and Fee-Reimbursements who's Father's are Govt Employees and in Very Good Position. after their Graduation they went to US for Higher Studies by showing minimum of Lacs of Property. if he is getting scholarship and Fee Reimbursement how he can show lacs of property for VISA. Good CM is not one only Passes Schemes but also take care of better Implementation.